Part of Jesus’ ministry was to heal the sick and there were many examples of him curing those who were ill or disabled. 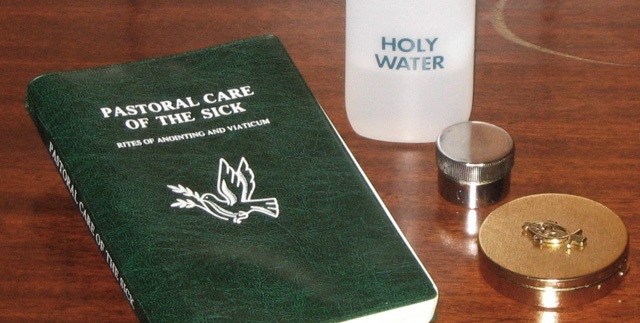 The anointing of the sick is administered to bring both spiritual and physical strength during an illness, but especially so near the time of death. “They cast out many devils, and anointed with oil many that were sick, and healed them” (Mark 6:13). Alongside the priest administering the last rites, the parish has a dedicated chaplaincy team who regularly visit the sick and dying in our local hospitals, offering prayers, company and support for those in their greatest time of need. The Chaplaincy Team visit the sick and dying at home or in hospitals to provide friendship, support and solace to those in ill health or those close to death.